Beets are one of those vegetables that people seem to either love or hate, with little middle ground. I must confess that when I was young I hated them. In my defense, I now believe that is because the only beets we had at the time came out of a can. They were mealy, bland, and what little flavor they had tasted of dirt. I can't imagine why I did not care for them. At some point when I was a little older my mother started pickling the canned beets with onions in a brine of vinegar and sugar. That brightened up the flavor and seemed firm them up a bit as well and I liked them enough to eat them without complaining. Occasionally, as an adult, I would order salads at restaurants that contained beets and discovered that I loved the way they complemented the greens and other vegetables. When I started shopping the Green City Market I could not resist the appeal of the fresh beets with the beautiful greens attached so I bought a bunch. I boiled them, peeled them, cut them up and put them in a salad. I had washed and chopped the greens and added them to the salad as well and it was quite delicious. Now I can't imagine life without beets. I love them in salads, soups, and by themselves. 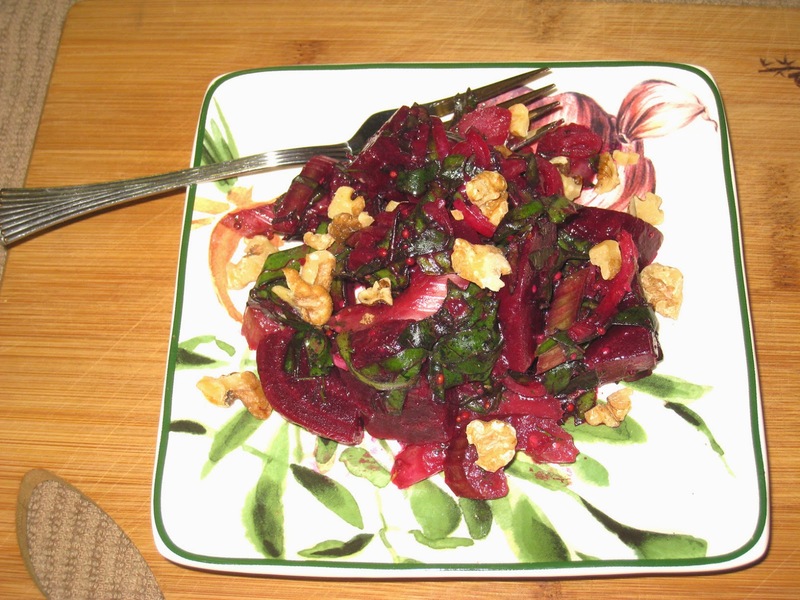 When possible I will use the greens with them, as I did in this Beet Salad with Mustard Seed Vinaigrette. I was as pleased with the mustard seed vinaigrette as I was with the salad. Beets and mustard actually go very well together. Mustard seeds add an extra crunch with the flavor. I bought a jar of Maille's Classic Old Style Mustard on sale a few years back and liked it so much I have replaced it a few times since then. It is a little pricey but goes a long way and is well worth the price, in my opinion. I also prefer their regular Dijon mustard and always have that on hand as well. The beauty of this salad, as with so many of my dishes these days, is that you can easily improvise. If you don't have shallots you can use any kind of onion. I often use fennel instead of or in addition to celery. If I have neither fennel nor celery, I make it without them. Your beets did not come with the greens attached? Use any kind of green - lettuce, baby kale, or spinach. And as long as you use any kind of mustard, vinegar and oil you have your vinaigrette. Combine the mustards and vinegar in a small bowl. Whisk until they are well incorporated. Add the olive oil gradually, whisking continuously, until you have an emulsion. Add the crushed garlic and salt and pepper to taste. If using right away, set aside. Can be made ahead of time and stored in the refrigerator. Remove the greens from the beets. Remove the leaves from the stems and rinse well (save the stems and saute them with other aromatics for frittatas, soups, or stews)l. Drain and roughly chop the leaves and set aside. Fill a saucepan large enough to hold the beets with cold water. Trim the stems on the beets down to an inch and leave on the roots. Place them in the saucepan with the water and bring to a boil. Reduce the heat to a simmer, cover, and cook until the beets are just tender, about 30 to 40 minutes. Drain and cool. When the beets are cool enough to handle, cut off the stem and root ends and peel them. The peel should come off easily in your hands. Chop then into bite-size pieces and put them into a large bowl. Thinly slice the scallions and add them to the beets. Trim the celery and thinly slice on the diagonal and add them to the bowl with the beets and shallots. Add the dill and the dressing in small increments until the salad is well covered, but not too wet. Mix well. Let sit for a couple of hours to let the flavors blend before serving. If refrigerated, take out an hour before serving. Garnish with dill and the toasted walnuts.